This book. This fabulously written, well-plotted and well-developed book. 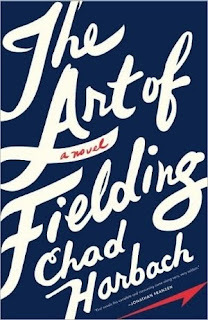 I'd heard good things about The Art of Fielding for a bit, so when one of the ladies in my book club basically demanded we read it, I was totally cool honoring her demand. Plot: Henry Skrimshander was born to be a short stop. When Mike Schwartz encounters him at a friendly tournament, he recruits Henry to come to small Westish College to play ball. Over the next few years Henry and Mike become best friends, and Henry remains error-less. Until one fateful day where a bad throw changes the lives of Henry and Mike, as well as Westish's affable president and Henry's roommate, Owen. Even though Henry's life is the main thrust of the book, Harbach's writing weaves together several story lines that cascade from one character's mistake. And let's not just gloss over the writing and how well it advanced the plot. Sure, he was deft at keeping things moving, but more than that, there were several spots in the book where Harbach's writing was pure poetry. The way he talked about love and change and loss had me wishing the book didn't have to end. Characters: I love good characters. Characters you can sink your teeth into and actually see leap from the pages of a book. Harbach created some wonderful characters. Flawed, but loveable. Real. Often when I read multiple story lines, I have a favorite, but in this case, I enjoyed them all and the characters flowed seamlessly in and out of the spotlight. The book may be about baseball, but its themes are so much broader.